Speck was awesome enough to send along one of their flashy new PixelSkin cases for review, and in short, it’s one of the best iPhone 4 cases I ever used. The Speck PixelSkin is not one of those simple cases you used for a few days then take it off, it’s something very different. It’s durable, stylish, compact and extremely protective. View our full written and video review here. The case is made out of durable silicon and covers the entire body of the phone. Surrounding every element of the iPhone 4 is a good amount of room between the top of the phone and the top of the case. For example the bottom/dock of the phone will never touch another item, or the the camera will never touch the table it is laying on. The same goes for the front of the iPhone/case. If the iPhone 4 is dropped facedown, the glass should not crack as there is room in between the case and the screen. You will see this in more detail in the video review below. You have easy access to the silent/ringer switch on the side, as well as the headphone jack, dock connector, volume rocker, power button, and home button. In addition, the speaker system and front facing camera is not obstructed by the case. This means there is no case covering them, but the aforementioned gap between the case and face of the phone makes up for that. While wearing the case, the phone obviously gets a little thicker. In our non-scientific measurements, we’ve determined the PixelSkin adds a thickness of 30-40% of the iPhone 4 itself. So imagine the iPhone 4 + 30-40% of an iPhone 4 stacked. To be honest, in numbers that may seem like a lot but in everyday use you will not notice it. It still fits in my jeans and short pockets just fine, and I do not need to alter how I carry my iPhone with me at all. Overall the Speck PixelSkin is a fantastic case, and we highly recommend it due to its protection features, material, portability, excellent build quality, and price. 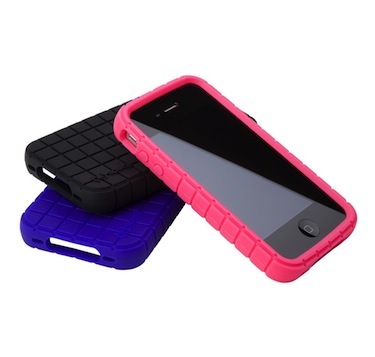 The case comes in three colors: black, purple, and pink and retails for about $25. You can get the Black Speck PixelSkin here on Amazon, or choose from the other colors here.